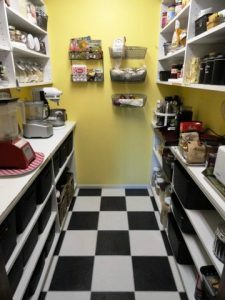 I just returned from a week’s trip to Seattle where I organized a friend’s kitchen, pantry and mudroom. 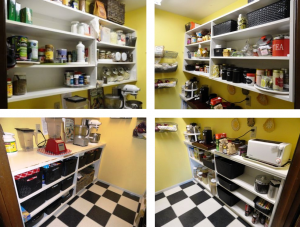 You can see that her pantry is quite beautiful and from her letter, which I’ve included below, Kathy’s transformation was not merely external, but internal, as well. The keys to success in organizing Kathy’s pantry: the combination of turntables and wicker storage baskets, plus her tremendously positive attitude! I had the amazing privilege of experiencing the results of Sue McMillin’s organizing expertise and wisdom. 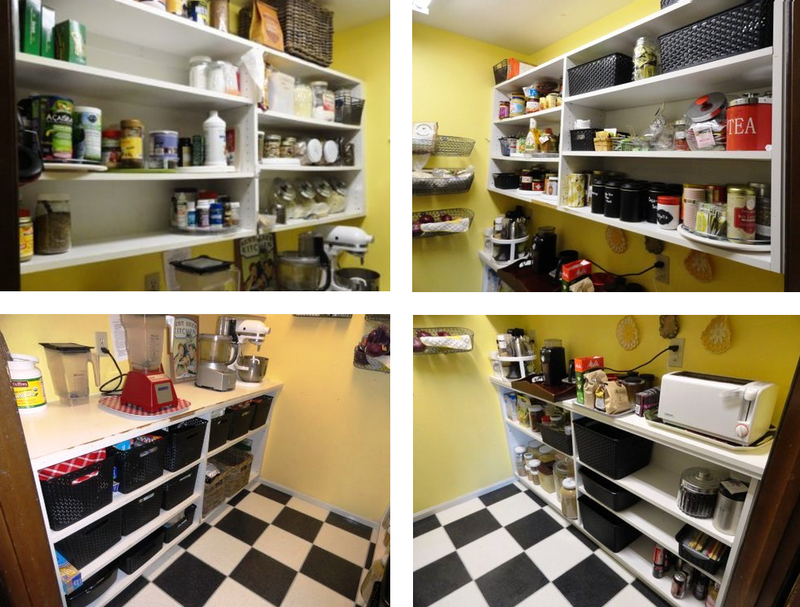 Sue coached and assisted me in the organizing of my very large kitchen and pantry. I have to admit I wasn’t “in the mood” for this endeavor. But I knew it was what I needed to remove one of the main impediments to accomplishing my goals and dreams and so I hired Sue to lead me in the process. However, it wasn’t but an hour into the organizing that it became rewarding and fun. Organizing is actually enjoyable, but also, SUE IS FUN. 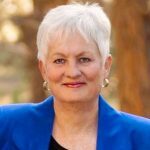 Sue provided a beautiful balance as she continually provided positive encouragement while firmly pressing on the underlying issues and causes of my disorganization. This I believe is creating a change of mindset regarding all my living spaces and habits. I understand now how clutter is not just a physical state but it reflects and affects our souls. But Sue doesn’t get legalistic here. There is a freedom that she wants to introduce into our lives as she guides us into our true identity as humans: we were made for more than enslavement to our stuff–both as it clutters up our lives and in the sense that possessions can easily possess us. She wants us to be set free to love people above our stuff and to streamline our living spaces to open up more time for others and for the things we were made to do: to live out those dreams which reflect our truest self. I am learning that my disorder is not the real me! On a daily practical level I have been preparing and cleaning up meals at the rate of one third faster! This is because I no longer have to go through clutter to get to what I need. I appeal to all potential clients: do not underestimate the value of a physically present coach to get your spaces organized. It usually just takes someone to come alongside and affirm that decision that five casseroles, or 50 boxes of tea, or 30 screwdrivers is excessive. Just knowing how or wanting to be organized doesn’t make it happen. We all “need a little help from our friends.” And that’s the icing on the cake. Sue arrives as an experienced professional but she always leaves as a friend. Sue’s services are valuable. And what is valuable has a price tag. But what price can you put on the trade-off? More time with your loved ones, less time in frustration and more freedom to be who you really are: that’s priceless.